By LA Beverly Hills Trained Dr. Philip Young who has over 15 years of Cosmetic Laser Experience! Importantly, the person in this healing diary is someone who is taking longer to heal based on more traditional cleaning methods and frequency. Through our years of experience, we believe in more frequent cleaning for much faster healing. Warning, some of the following photos are graphic in nature. She was right. The crusting, which looks like dried honey, needs to be removed. At this point, we wanted her to continue cleaning every 2-3 hours (or as frequently as every hour to keep the crusting off) as our other pages have discussed under our laser resurfacing main page. At this point, I was urging her to make sure the process was continued. I told her to wash with cetaphil, lathering only with her hands and patting it on her face. Then rinsing with water, cool water. I told her never to pick off her scabs but to let the moisture of the rinsing allow the crusting to come off on its own. The crusting should come off after each washing and you should apply the vaseline on the skin only after the crusting comes off as completely as possible. Any showers were to be luke warm and the shower water should never hit the face directly. After this, we wanted her to rinse with vinegar and water (1-3 teaspoons of over the counter white grocery vinegar with 1 quart of water). To help with the crusting, you can even submerge your face in water to allow the crusting to come away. The vaseline is vitally important for the cells to grow over the treated skin and you have to keep it on for the first 1-2 weeks until the skin is healed over. Possibly a little less redness but the crusting has become more aggressive. I told her to be aggressive with the cleaning. At this point, she was frustrated with the crusting and telling us that it was not coming off (which I can totally understand!). I told her to do more of the submerging in the water / vinegar and water. Also, I mentioned that sometimes using cotton balls with the vinegar and water solution and patting it on the face can help remove some of the crusts. Sometimes, too much washing can be a factor in not allowing the skin to grow. So at the most you should clean it every 2-3 hours (or as frequently as every hour to keep the crusting off, and you should only be applying vaseline on the area after all the crusting is removed) the first 2-3 days and then taper off slowly to 2-3 times a day by the end of the week or day 7 only if the crusting is under control. 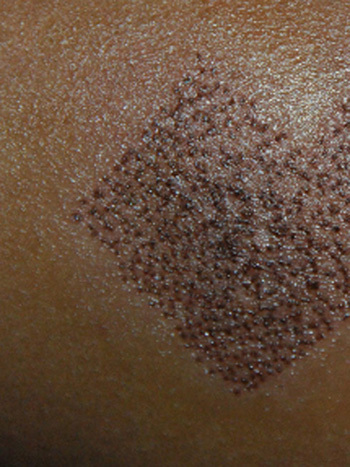 The crusting below that can appear like brown crusts, and differently for different types of skin types, are the type of crusting that does not necessarily need to come off. These areas still need to be cleaned every 2-3 hours or as frequently as the other areas that you are working on concomitantly. She is still very red. But I can see that the skin is almost healed over. She is healing pretty fast. 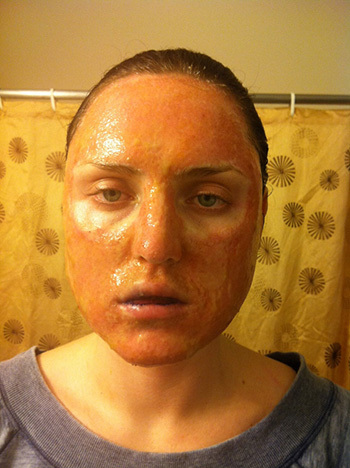 There is the dry crusting on her face that needs to be reduced by rinsing and cleaning. The key again is to never pull the crusting off; this could cause scarring, but to allow the moisture to cause the crusting to come away with the washing. I’m not too worried about this crusting as much as the honey crusting. This crusting is not likely to get infected and lead to scarring because it is dry crusting. At this point, I was telling her to keep pushing on the cleaning but slow down on it to every 2-4 hours. But, again, all the crusting and flaking should come off with each cleaning and before the vaseline is reapplied. The cotton balls seemed to be working at helping to reduce the crusting. I think that she should be a little more aggressive with her cleaning on her nasal bridge, chin and the other areas with the crusting. In those areas she could stick with the 2-3 hour interval (or as frequently as every hour to keep the crusting off, and you should only be applying vaseline on the area after all the crusting is removed) but for the rest of the face I would stick with 4-5 hours or longer. For the white tissue, submerging could help as well as the cotton ball application of the vinegar water mixture. Although there is some white feathery tissue, I can tell that the skin is healing well and on track. At this point, I would reiterate what I just mentioned for this day and start slowing down on the cleaning a little bit. 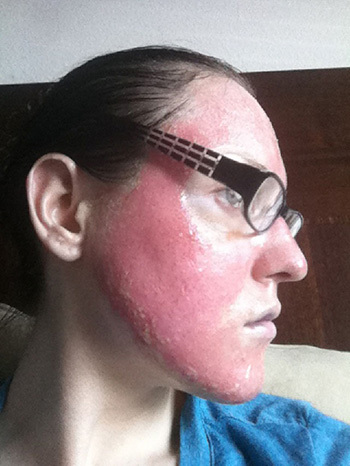 Day 5 after cO2 Laser Resurfacing Recovery: She is looking fabulous. She didn’t write at this point because she was doing well. The crusting is now essentially gone and she looks like her skin has grown over but she is still very red from the procedure. But there doesn’t appear to be any scarring. If there was some honey crusting at this point, I would be a little more concerned. Sometimes pain and severe itching can indicate an underlying infection. But mild itching is normal. Any areas that are more crusting than others are a concern. 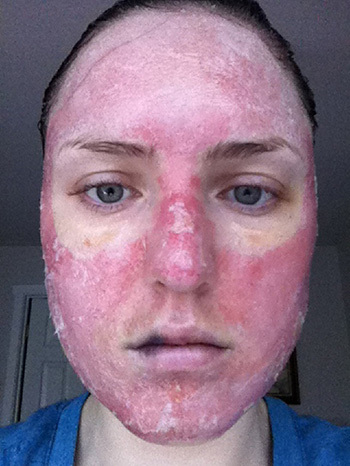 Day 6 after cO2 Laser Resurfacing Recovery: The patient looks more pink and less red and the crusting is much better and more reduced completely. At this point, the cleaning should be much slower and less aggressive. Two to three times a day would be appropriate for the cleaning. 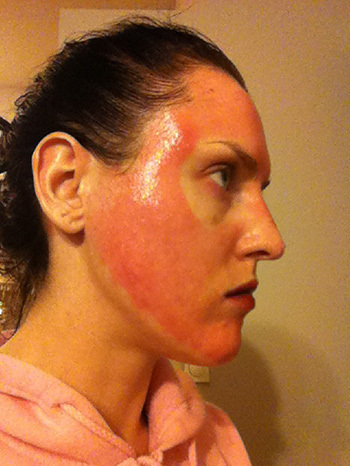 Day 7 after cO2 Laser Resurfacing Recovery: The redness has gone down and now the skin is pink. She still has some crusting on the nasal bridge which should stay at the interval of every 4-5 hours of cleaning or more to remove the crust and then the process of slowing down. If this crust is not cleaned more aggressively, scarring could happen. So we are advising more aggressive cleaning on the nose mainly and the rest of the face 2-3 times a day. 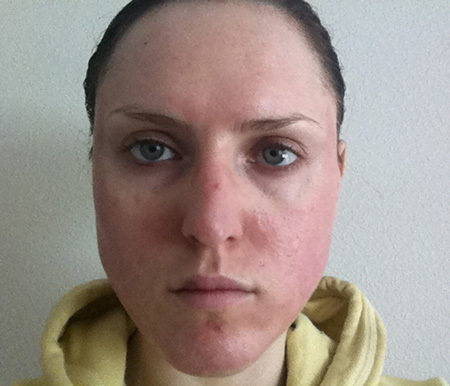 Day 8 after cO2 Laser Resurfacing Recovery: More improvement on this day. The only concern would be the nose and any areas that didn’t look like the rest of the skin. We aren’t out of the woods yet. 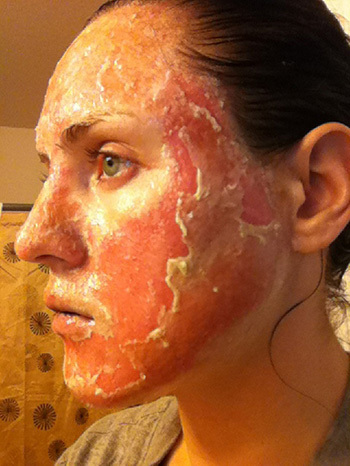 Even though you could have good healing at this time, scarring could develop later. Some signs of scarring are skin thickening, severe itching, pain and blistering that occurs after your skin is healed over. 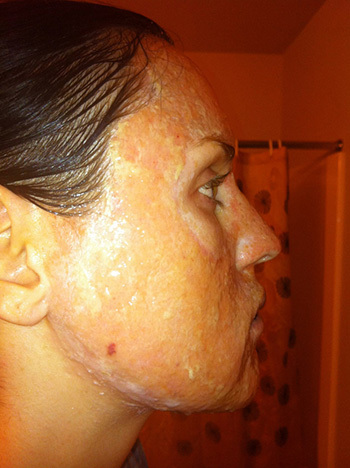 Topical or Oral Antibiotics, steroid creams are some of the solutions to this issues. We would want to see you if there are any problems. She is still doing well. Now we just want to look out for some of the things I mentioned regarding scarring above. This is where having a doctor that you can get a hold of is so important. My cell phone is on my voice mail and I can always be reached via email. In terms of her question, vaseline can really be used for about 2 weeks. If the skin is pink, not oozing, not crusting, is healed over or you have peeled, you could start your regular non abrasive, gentle skin care at day 7 at the earliest. We recommend something similar to Cetaphil Gentle Cleanser and Lotion. The key is using something gentle and hypoallergenic. 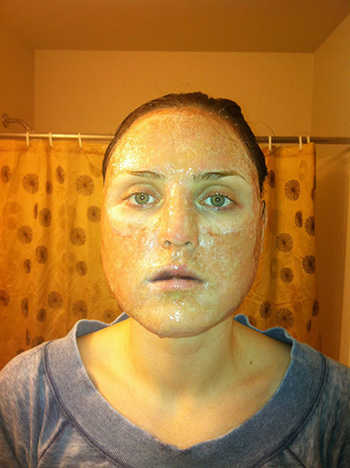 There should be no crusting or any raw areas when you start your regular skin care. 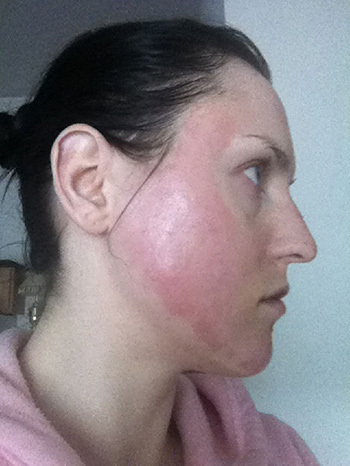 The topicals (retin A, epiquin / hydroquinone, and hydrocortisone) should not be started until 4 weeks later. At the earliest you could do it at 2 weeks but you need to carry out test spots to see if they are causing any irritation. The small 1-2 cm diameter test spots should have 2-3 days to assess whether there is any irritation from starting the topicals too early. If there is no irritation you could start the topicals early. 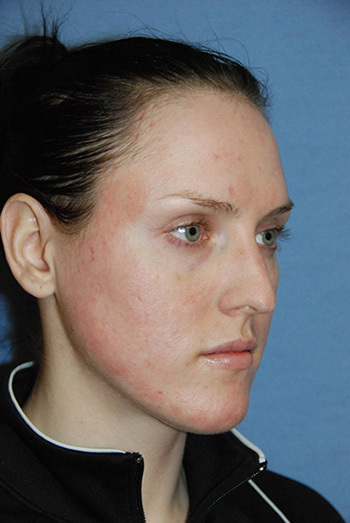 Breakouts are handled by antibiotics such as clindamycin, doxycyline, minocycline, tetracycline. 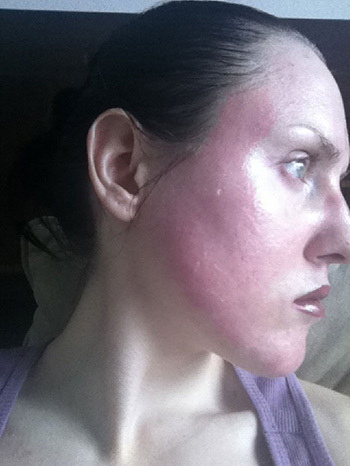 Day 12 after cO2 Laser Resurfacing Recovery: The pink color is subsiding and much more manageable. 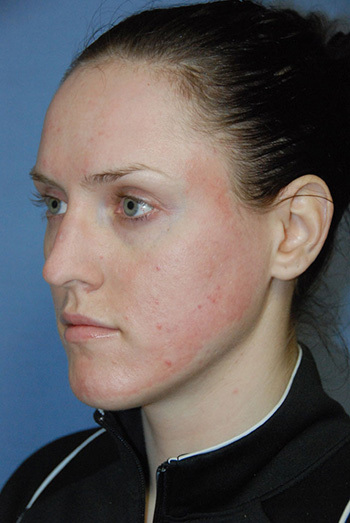 The signs of scarring and breakouts are continually watched for and any issues should be brought up with the doctor. We can be Contacted here and our phone number is 425-990-3223. 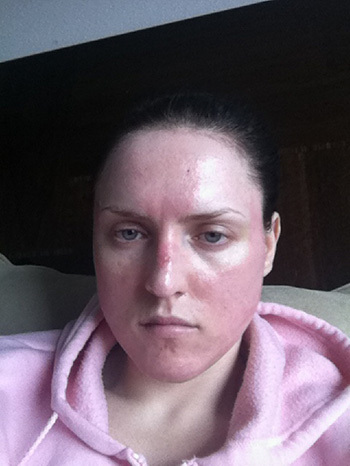 Day 17 after cO2 Laser Resurfacing Recovery: Much more normal looking at this time. 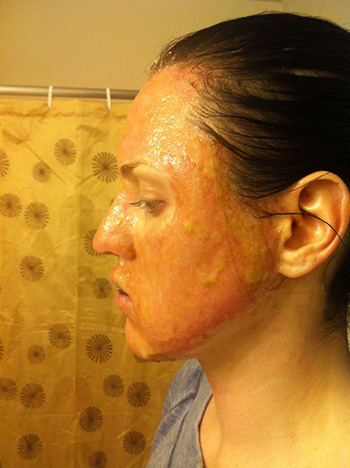 There are no breakouts and signs of infection, or scarring. We will keep following here for a lifetime to make sure her results are great. 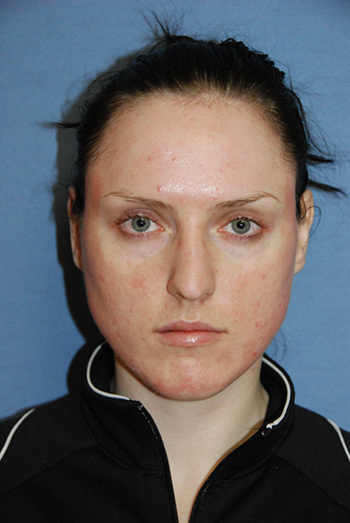 cO2 Laser Resurfacing Recovery / Before and After: The pictures below are comparing the before and afters (day 17) thus far. We will continue to update this page for your information. At this point in time, we usually are not going to see major changes and improvement to the scars. 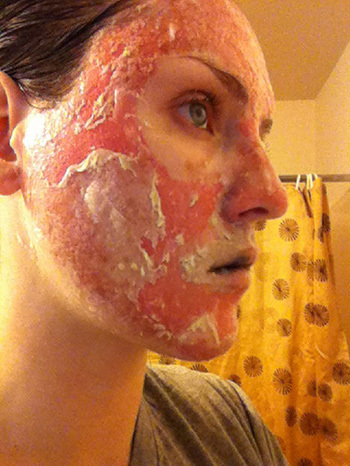 Sometimes the results will take up to a year to get better as the skin heals. So, as I was telling this patient as well, you have to be patient with the results as it takes time for your body to reconstruct the scars and develop tissue to make them look better. We will update this with more current photos!